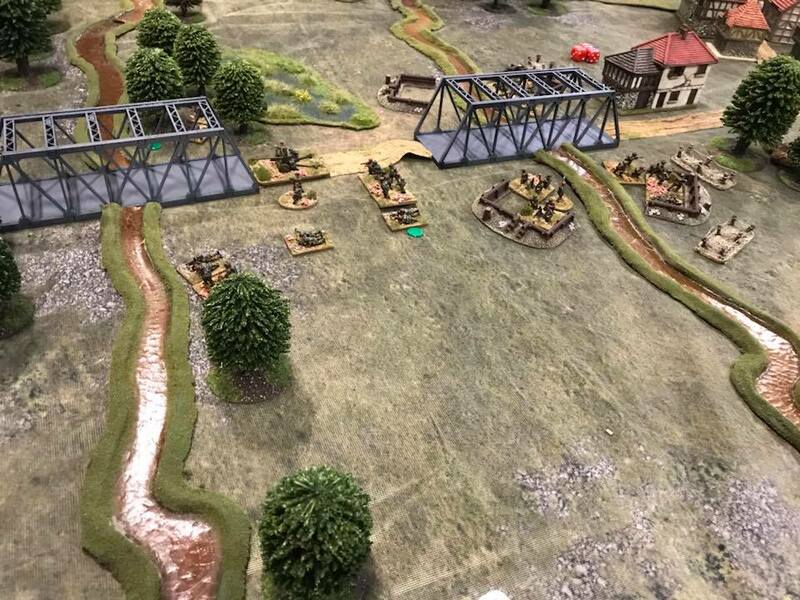 15mm WW2 using IABSM by the TwoFatLardies tonight at the South London Warlords Club, with gallant British Paras holding two bridges (Ham and Jam) versus German counterattacks on the morning 6th June 1944. This was a loosely based on the real events, and a good club game. The Paras rolled for casualties lost in the initial assault, and then set up on Blinds or hidden. Germans had six Blinds, each one potentially coming on at six different entry points. The Paras had a company of infantry (less casualties); a 6pdr AT gun; a mortar team and an HMG; plus all the captured German defences. 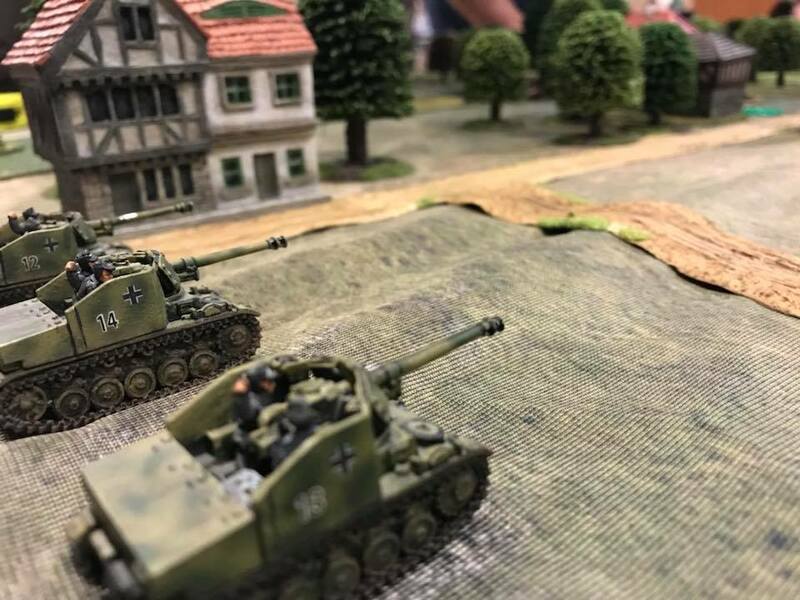 The Germans had six infantry sections, three Marders, three StuGs and a Company HQ in half-tracks but, as mentioned, not all coming on at the same entry point, and only one unit on each turn of the German Blind card: so no guarantee a new unit would come on at all each turn! This turned into a great little game with the added special cards adding flavour: such as the Allied Low on Ammo, or adding an extra Anti-Tank Fire card to represent the Elite Paras' battlefield nouse. The Germans made good progress in attacking one bridge, but at quite a cost. The Paras lost all their Big Men , and after taking heavy HE fire had to withdraw across the river. 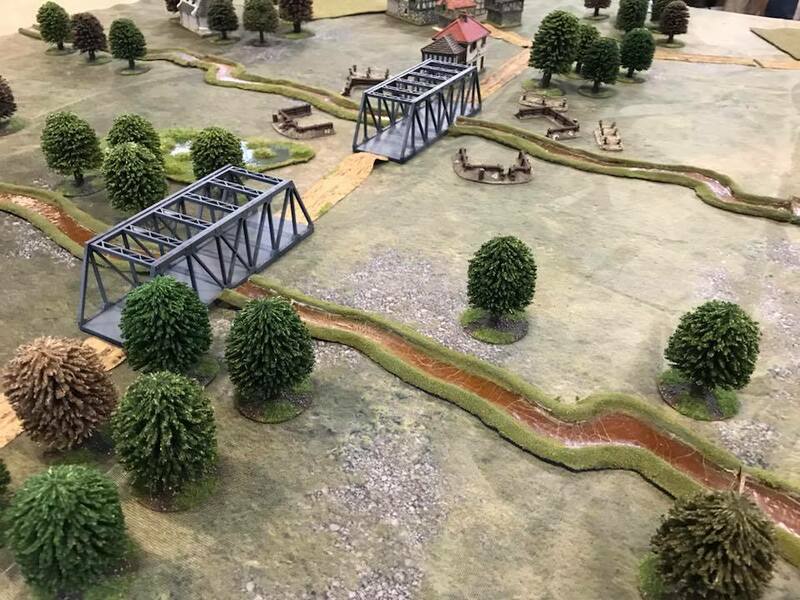 The other bridge was never really threatened by the Germans until the last turn, but I doubt they would have done a lot more. The interesting decisions for the Germans were all to come, as somehow they would have to actually take the bridges, and I doubt they could have done that without more support. Thanks to Andy T for planning the game and to Glen, Iain F and Dan "nice suit" N. Only a few photos as I was too busy umpiring.